Their marriage on the rocks, James and Cora Bevan flew to Jamaica for a last chance at patching things up. But in the slums of Kingston James found himself fighting for his life—while Cora found her own path to destruction, in the arms of another man. Available for the first time in more than 50 years, this lost novel by legendary pulp author David Goodis is a stunning, shocking tale of cruelty, danger, desperation...and the possibility of redemption. A lost novel by one the greatest pulp authors—first publication in more than 50 years! 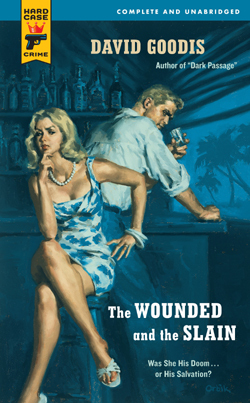 Boldtype on THE WOUNDED AND THE SLAIN: "Pure, unadulterated noir from a very hard place, indeed." "Some of the best crime writing of the genre�s golden decades." "In his day David Goodis ranked with pulp greats Raymond Chandler and Dashiell Hammett." "This is pulp writing of a whole other stripe...David Goodis suffered for his art, but what great art it was."